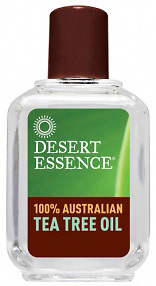 Tea Tree Oil, 2 fl oz / 60 ml (Desert Essence) - Penn Herb Co. Ltd.
100% Pure Australian Melaleuca Alternifolia (Tea Tree Oil). Terpinen 38+, Cineole <3%. Add 1 or 2 drops to wet cotton pad for application to appropriate skin areas. WARNINGS: Do not use full strength on skin. Dilute with water or carrier oil and then test a small amount against clean skin on forearm 24 hours prior to use. For external use only.